Oppana is a popular dance form among the Mappila community of Kerala, south India, prevalent all over, especially in the northern district of Malappuram.The Malayalam word Oppana Pattu is the derivation of Tamil word ‘Oppanai Pattu’. In Tamil ‘Oppanai’ means make up. 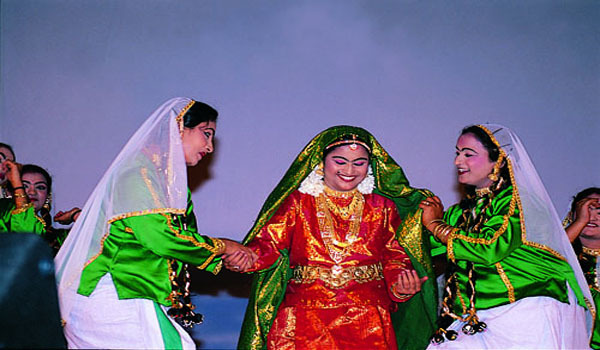 Oppana is a dance form and a performing art practiced by the Muslim women in the Malabar region of Kerala, especially the districts of Canaonore, Calicut and Malappuram. It is believed that the word Oppana derives its origin from the word Afna (Arabic). It is performed to commemorate the nuptial celebrations of the bride and is part of the wedding festivities. Oppana is generally presented by females, numbering about fifteen including musicians, on a wedding day. The bride dressed in all finery, covered with gold ornaments and her palms and feet adorned with an intricately woven pattern , sits amidst the circle of dancers. She is the chief spectator sitting on a peetam (chair), around which the singing and dancing take place.While they sing, they clap their hands rhythmically and move around the bride using simple steps.The songs sung are called Mappilapattu and are sung firstly by the leader and the remaining women lend the chorus. The instruments played along are the Harmonium, Ganjira, Tabla and Elathaalam.Oppana dance is not vigorous and the steps are simple and movements graceful.There are two types of this style Oppana Chayal is performed that does not involve the clapping of hands. The other type of Oppana is Oppana Murukkam.